i have officially started my holiday knitting! and hold on to your hats… because i might actually have my presents to their recipients on time this year. you know, the girl who does craft fairs and thus doesn’t send/knit for the family until late – usually mid january is when they get them. 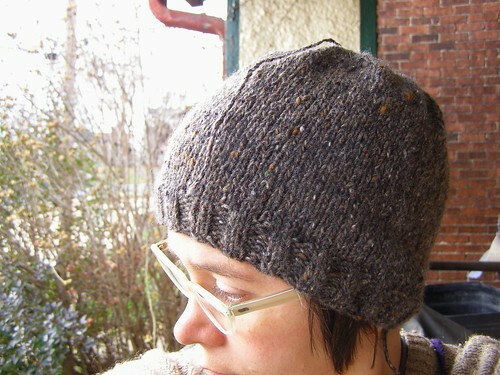 i honestly don’t find hat knitting boring at all… and especially not when it’s heading to a good home to be loved. and not when it’s in this divine tweedy cashmere yarn. yum. i would now like to put in a little plug for some holiday knitting at the studio – both of the free come knit with me type and the class type. First, the classes. 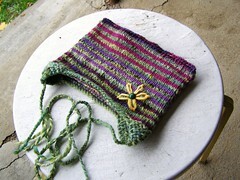 I am offering several classes this December with the holiday knitter in mind. More information can be found here, but the basics are below. These classes are still often on Thursday nights, but come January most classes will be on Saturday and Sunday afternoons! If interested, you can see the Jan/Feb schedule here. Still missing a couple of holiday gifts? 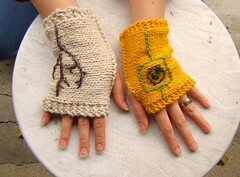 Come bust out some mitts for your favorite fingerless mitt fan. This class comes with a recipe for super simple mitts that can be made with any yarn and tips on how to make them really special with some embroidery. Last minute gifts don’t need to be stressful if you make them with thick enough yarn. Join me to make a fun and funky square baby hat for that lovely little one in your life. This class will include a recipe for making the hat and a tutorial on how to make it your own by adding tassels, earflaps, or embroidery. Join in this last ditch effort to make a beautiful drop-stitch scarf in only a fraction of the time it would take you to knit anything else. A guaranteed pleaser, this scarf is easy as pie and looks great when finished. Have a couple of folks you can’t figure out what to give this year? I recommend this! 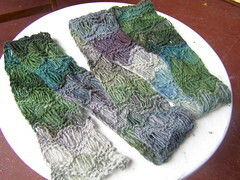 And even better, this pattern can easily be worked with any size of yarn. Please note that the Open Studio Schedule will be more consistent come the new year! They will be the first Friday of the month from 4-8 and the third Sunday of the month from 2-6. I will continue to make facebook events for them, so be sure to follow cosymakes on facebook. Here’s the one coming up. This entry was posted in classes, community, cosyknitsliterally, hats, knitting, open studio, studio by cosymakes. Bookmark the permalink.